Pottery is the craft, but the Glazing is MY Art. My b​​​eautiful variations of color in the glaze create unique, one-of-a-kind pieces. Ideal as a gift or a keepsake. Perfect for everyday use. Dishwasher and food safe. Each stoneware pieces is individually handmade or hand-thrown on the potters wheel in my studio located in Cary, NC. My art is created using Cone 6 Stoneware Clay. During the drying process, the clay must be handled very carefully. It needs to be pampered, cleaned up and details added; this stage the piece is called greenware. The clay must be completely dry in order to be fired; which takes the longest (2-5 days.) When it is bone dry it is ready to be low fired, Cone 01-04, to create bisqueware; eliminating most of the water content so that the piece can be glazed without harming the form. Bisque firing adds at least two production days to the length of time to create the piece, a day to be fired and a day to cool. I do most of this work in my studio. 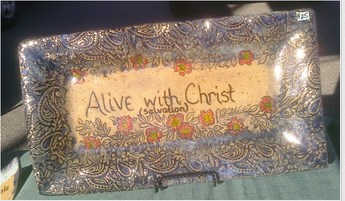 My stoneware ART is created to inspire HOPE & JOY for everyday living. My motivation is to put God 1st -Seven days a Week. My desire is to help spread God's Love through my pottery and His Spirit, with Peace, Love, Joy, Patience, Kindness, Goodness, Faithfulness, as I live in a community with others. My Hope is that my art is a subtle reminder of how much God Loves us and to give other the same HOPE. 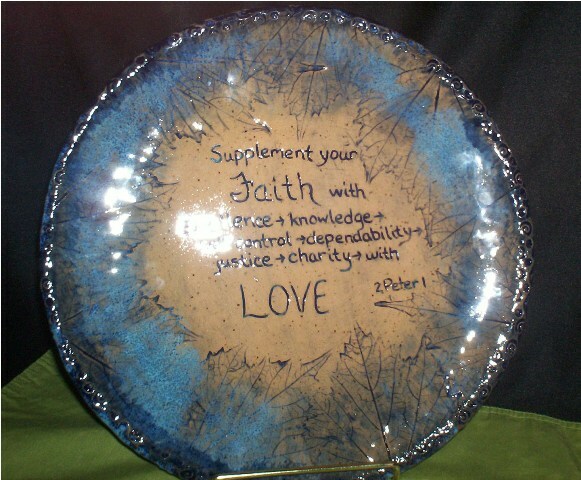 My stoneware ART is created to inspire HOPE & JOY for everyday living. Ideal as a gift or a keepsake. 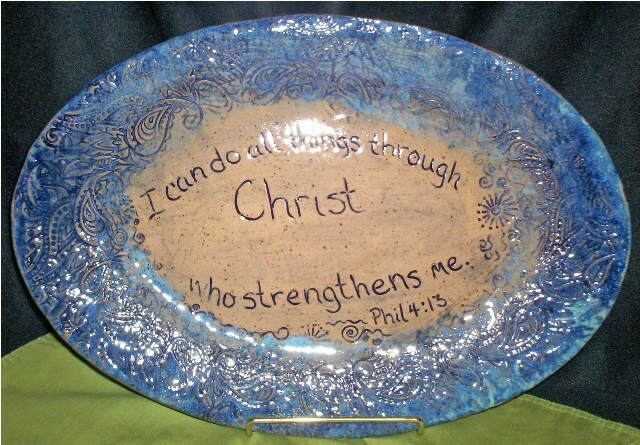 Inspired to place God at the forefront of my thoughts everyday, every hour, every minute, that is why I create inspirational pottery, Pottery with God's Word on it. ​I believe that when you have God's Word as Art in your home, you not only read it for yourself, transforming you from the inside; YOU also allow visitors to read it; ​​planting the Seed of Hope. Each stoneware pieces is individually handmade or hand-thrown on the potters wheel in our studio located in Cary, NC. Perfect for everyday use. Beautiful variations of color in the glaze create unique, one-of-a-kind pieces. 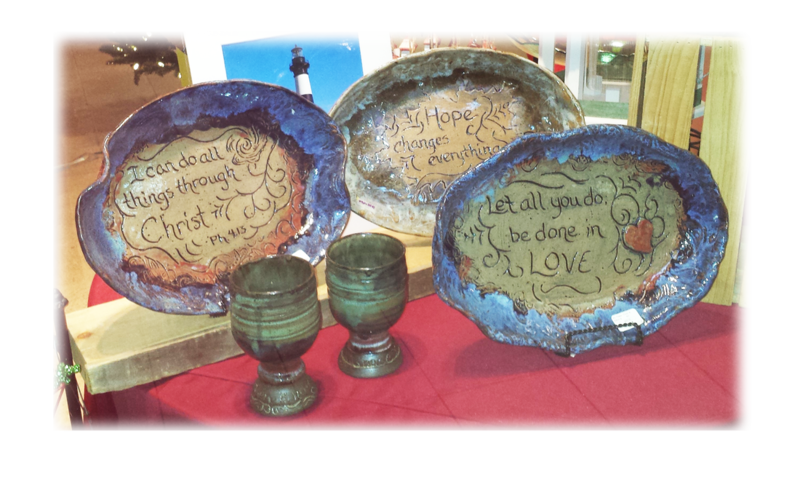 Our stoneware ART is created to inspire HOPE & JOY for everyday living. Ideal as a gift or a keepsake. Our customers tell us that our pottery is a favorite of theirs. 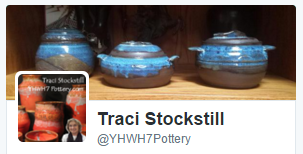 ​​Purchase my pottery at Local Festivals, Farmers Markets or shop online with the links below..